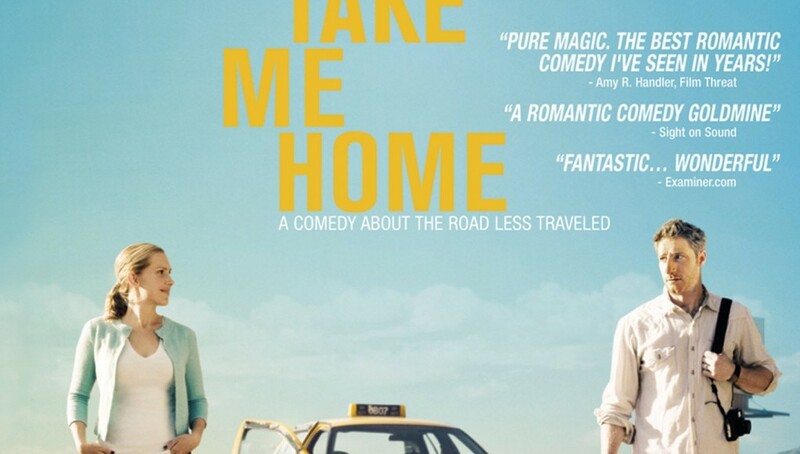 Not quite the screwball of the 1930s and 1940s, Take Me Home exhibits much of the tropes of romantic comedies and road movies that appear often, yet the film has inherent inner struggles that speak louder than the over-abused tropes that litter most romantic-comedies. Writer, director, and star Sam Jaeger of NBC’s Parenthood fame teams up with his wife Amber Jaeger and a slew of familiar, but non-house-hold names to create road movie for a common search for a place to call home. Thom (Sam Jaeger) is a down-and-out photographer who moonlights as an unlicensed taxi driver. His bad day begins with being rejected from a job, then evicted from apartment, and thus begins his what would be a typical night as a cabbie. By chance, he picks up Claire (Amber Jaeger), who has also had a bad day now that her marriage is on the rocks. In her inebriated state she says “Drive,” and passes out. And so he does, across the country. The merge between romantic-comedy and road movie is nothing new, of course. However, Thom is a chronic pathological liar attempting to quash his pathetic attempts to be independent. Claire is in no position to hear about such lies now that she questions her husband’s fidelity, which itself was hidden behind a veil of success and financial wealth. Their meet-cute smashes their worlds together, now that Claire is without the financial backing she is used to, and Thom never had it to being with. Both characters are experiencing life-changing crises and their meet-cute forces them to face their inner struggles on a journey with a complete stranger. Their clashes are often the product of social and economic stereotypes that they place on each other, and their common journey of looking for their own place to call home. The film itself is anything special. The performances are cute but ultimately unappealing. The characters themselves do happen to have a chance to walk in each other’s shoes. Thom and Claire watch an older couple sit silently across from each other at a diner. Thom sees what he believes, a pessimistic inference that this elderly couple remained with each other because of tradition. Claire, despite her own particular situation, has a more optimistic sense; this elderly couple know each other so well, they have no reason to talk. Later in the film, this same situation arises again, but with the main character’s switching philosophies based upon their own inferences and their relationship to the next iteration. The performance between the Jaegars dominates the narrative, but the film features many cameo appearances from familiar character and television actors such as Victor Garber (Alias, Titantic), Lin Shaye (Kingpin, Stuck on You), Brennan Elliott, and Michelle Krusiec. The film’s set-up is familiar but the inherent conflict has relevance and urgency as the narrative is set against the current economic and social conflicts that face our country. While the film is far from a failure, it suffers from the same issues that many independent comedies have today. Take Me Home is simple and easy to consume. There is no reason to ponder more than what is presented, and all lose ends tie up so well, you could have seen it from the moment Claire enters Thom’s taxi. However, there are some conflicts and dialogue that sparks interest, such as the aforementioned discussion of the elderly couple. Overall, the title explains the struggle; Take me home, even if I do not know where it is.